Tour grand palaces and buildings and hear about religious worship in Jerusalem during the early days of Islam. Since its beginning, Islam had granted <?xml:namespace prefix = st1 ns = "urn:schemas-microsoft-com:office:smarttags" />Jerusalem a special status. The Prophet Mohamed himself first set Jerusalem as the direction of prayer before he changed it to Mecca. Although Jerusalem surrendered to the first Islamic conquests, it is said that the Khalif Omar, who visited Jerusalem, rebuilt the Temple Mount from its ruins. A new era began in Jerusalem, and soon government buildings were being built alongside mosques and magnificent monuments that were meant to increase Jerusalem’s status within Islam. We will learn the answers to questions: Who did Mohamed meet when he rose to Heaven? Who is the Jew who determined where the Al-Aqsa Mosque would be built? Who really built the Dome of the Rock? And where are the hidden grand palaces of rulers from Damascus? 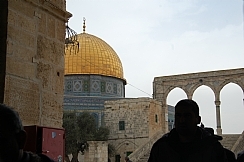 The sites of the tour include the Temple Mount, the Archeological Garden, and the Davidson Center. Some of the sites on the tour require an entrance fee.